Access keys are long-term credentials for an IAM user or the AWS account root user. You can use access keys to sign programmatic requests to the AWS CLI or AWS API (directly or using the AWS SDK). For more information, see Signing AWS API Requests in the Amazon Web Services General Reference. Access keys consist of two parts: an access key ID (for example, AKIAIOSFODNN7EXAMPLE) and a secret access key (for example, wJalrXUtnFEMI/K7MDENG/bPxRfiCYEXAMPLEKEY). Like a user name and password, you must use both the access key ID and secret access key together to authenticate your requests. Manage your access keys as securely as you do your user name and password. Do not provide your access keys to a third party, even to help find your canonical user ID. By doing this, you might give someone permanent access to your account. As a best practice, use temporary security credentials (IAM roles) instead of access keys, and disable any AWS account root user access keys. For more information, see Best Practices for Managing AWS Access Keys in the Amazon Web Services General Reference. If you still need to use long-term access keys, you can create, modify, view, or rotate your access keys (access key IDs and secret access keys). You can have a maximum of two access keys. This allows you to rotate the active keys according to best practices. When you create an access key pair, save the access key ID and secret access key in a secure location. The secret access key is available only at the time you create it. If you lose your secret access key, you must delete the access key and create a new one. For more details, see Resetting Your Lost or Forgotten Passwords or Access Keys. 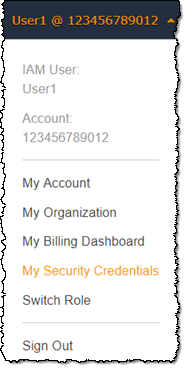 You can use the AWS Management Console to manage an IAM user's access keys. To create an access key, choose Create access key. Then choose Download .csv file to save the access key ID and secret access key to a .csv file on your computer. Store the file in a secure location. You will not have access to the secret access key again after this dialog box closes. After you have downloaded the .csv file, choose Close. When you create an access key, the key pair is active by default, and you can use the pair right away. To disable an active access key, choose Make inactive. To reenable an inactive access key, choose Make active. To delete an access key, choose its X button at the far right of the row. Then choose Delete to confirm. When you delete an access key, it's gone forever and cannot be retrieved. However, you can always create new keys. Choose the name of the user whose access keys you want to manage, and then choose the Security credentials tab. To create an access key, choose Create access key. Then choose Download .csv file to save the access key ID and secret access key to a CSV file on your computer. Store the file in a secure location. You will not have access to the secret access key again after this dialog box closes. After you download the CSV file, choose Close. When you create an access key, the key pair is active by default, and you can use the pair right away. Choose the name of the intended user, and then choose the Security credentials tab. The user's access keys and the status of each key is displayed. Only the user's access key ID is visible. The secret access key can only be retrieved when the key is created. Above the table on the far right, choose the settings icon ( ). In Manage columns, select Access key ID. The Access key ID column shows each access key ID, followed by its state; for example, 23478207027842073230762374023 (Active) or 22093740239670237024843420327 (Inactive). You can use this information to view and copy the access keys for users with one or two access keys. The column displays None for users with no access key. Only the user's access key ID and status is visible. The secret access key can only be retrieved when the key is created. In the search box, type or paste the access key ID of the user you want to find. Choose Close to return to the list of users and confirm that the filtered user owns the specified access key. To manage an IAM user's access keys from the AWS CLI, run the following commands. To manage an IAM user's access keys from the AWS API, call the following operations. As a security best practice, we recommend that you regularly rotate (change) IAM user access keys. If your administrator granted you the necessary permissions, you can rotate your own access keys. Administrators, for details about granting your users permissions to rotate their own access keys, see AWS: Allows IAM Users to Manage Their Own Password, Access Keys, and SSH Public Keys on the My Security Credentials Page. You can also apply a password policy to your account to require that all of your IAM users periodically rotate their passwords. You can choose how often they must do so. For more information, see Setting an Account Password Policy for IAM Users. As a best practice, do not use your AWS account root user. If you use the AWS account root user credentials, we recommend that you also regularly rotate them. The account password policy does not apply to the root user credentials. IAM users cannot manage credentials for the AWS account root user, so you must use the root user credentials (not a user's) to change the root user credentials. Note that we recommend against using the root user for everyday work in AWS. You can rotate access keys from the AWS Management Console. While the first access key is still active, create a second access key. Choose the name of the intended user, and then choose the Security credentials tab. Choose Create access key and then choose Download .csv file to save the access key ID and secret access key to a .csv file on your computer. Store the file in a secure location. You will not have access to the secret access key again after this closes. After you have downloaded the .csv file, choose Close. The new access key is active by default. At this point, the user has two active access keys. Update all applications and tools to use the new access key. Determine whether the first access key is still in use by reviewing the Last used column for the oldest access key. One approach is to wait several days and then check the old access key for any use before proceeding. Even if the Last used column value indicates that the old key has never been used, we recommend that you do not immediately delete the first access key. Instead, choose Make inactive to deactivate the first access key. Use only the new access key to confirm that your applications are working. Any applications and tools that still use the original access key will stop working at this point because they no longer have access to AWS resources. If you find such an application or tool, you can choose Make active to reenable the first access key. Then return to Step 3 and update this application to use the new key. Locate the access key to delete and choose its X button at the far right of the row. Then choose Delete to confirm. In Manage columns, select Access key age. The Access key age column shows the number of days since the oldest active access key was created. You can use this information to find users with access keys that need rotating. The column displays None for users with no access key. You can rotate access keys from the AWS Command Line Interface. At this point, the user has two active access keys. One approach is to wait several days and then check the old access key for any use before proceeding. Use only the new access key to confirm that your applications are working. Any applications and tools that still use the original access key will stop working at this point because they no longer have access to AWS resources. If you find such an application or tool, you can switch its state back to Active to reenable the first access key. Then return to step Step 2 and update this application to use the new key. How to Rotate Access Keys for IAM Users. This entry on the AWS Security Blog provides more information on key rotation. IAM Best Practices. This page provides general recommendations for helping to secure your AWS resources. You can rotate access keys using the AWS API.